Gabriel Fernandes' Puzzle Collection: Lexomino Puzzle "Gabriel M P F"
Lexomino Puzzle "Gabriel M P F"
The letters are all laser cut from thick acrylic, and for now, are only available in a translucent gray color. 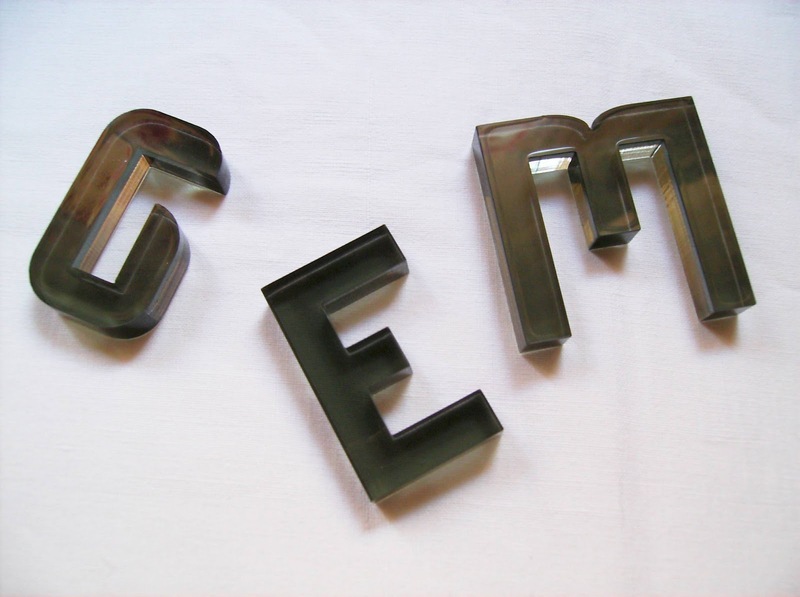 Most of the letters have a dimension of 3x5 units, although some have to be a bit bigger (R, M). It's also a nice twist to have different size letters, to make the puzzle a little more complex. The box has a dimension of 5x5x5 units (the smallest possible for this configuration), and it's laser cut from 0.20" plywood and glued together. 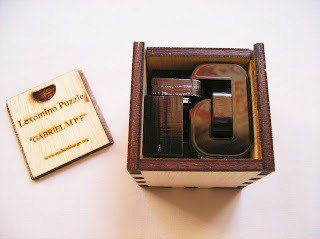 The name of the puzzle, your name configuration and the designer's website is engraved on the box's sliding lid. There are several box sizes available, depending on the number of letters you choose, so check the Lexomino's website for more information on that. Each puzzle is unique in terms of packing and solutions available. 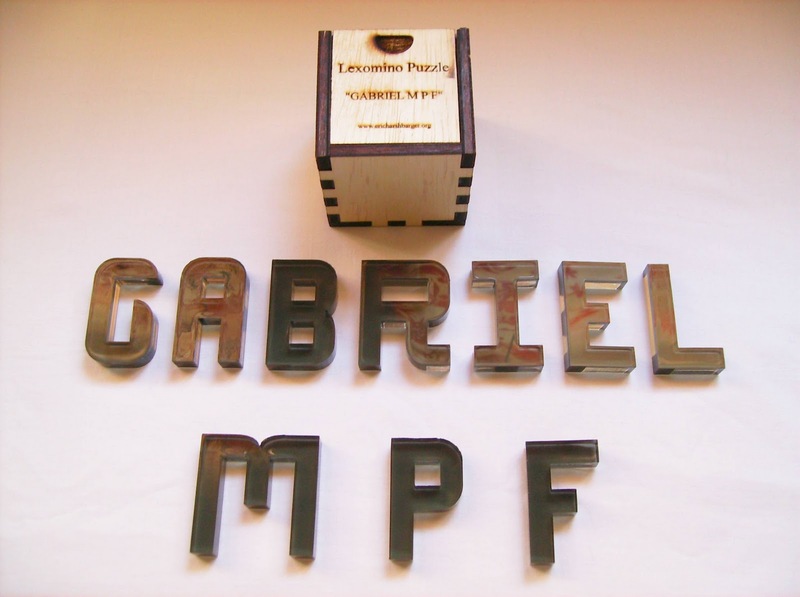 The "Gabriel M P F" puzzle has 2 unique solvable solutions and will occupy a volume of 110 voxels out of 125 (88%), for 10 letters. Each puzzle will also have its own degree of difficulty. Some might have just one solution, others just a couple, and some could have even hundreds of solutions. 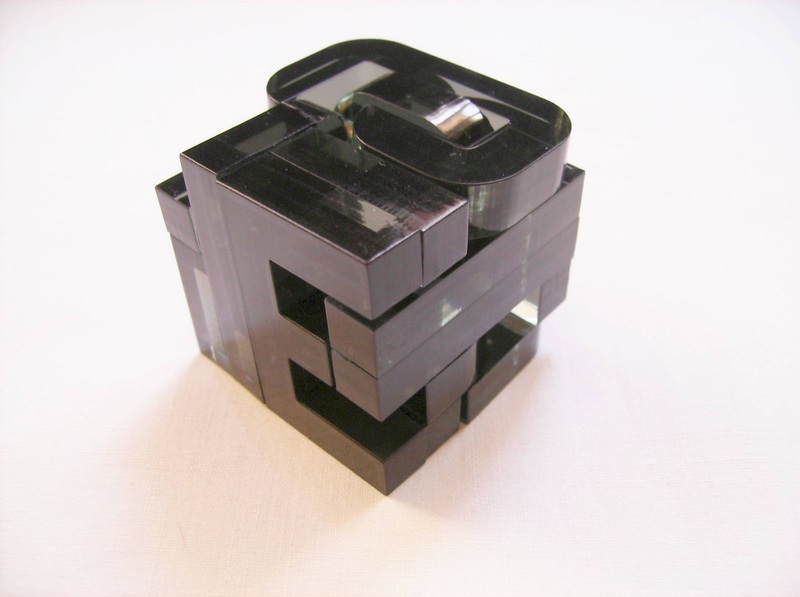 Ultimately, it will depend on how well your puzzle can be packed into a cubic box. Note that for some puzzles, it might not be possible to fit into a 5x5x5 box or if you choose a larger box, it could leave many empty spaces, therefore it will be better to choose one size that fits all the letters as tight as possible. Be sure to check out with Eric your puzzle configuration, box size, available solutions, etc. I tried several different configurations with him before choosing the final one, as some of them would be too easy or would leave many empty spaces. The final version of all those failed configurations, resulted in a great puzzle with only 2 solutions, and hard ones, by the way. As of now, I only managed to find one solution and it took me about a week to solve it. The other solution appears to be completely different, because I've tried to swap just a couple of pieces around, and it wasn't possible, so plenty of replay value with this one. Other interesting fact about the possible solutions for any given puzzle is that, no matter how many solutions it has, just one or a hundred, the level of difficulty is not directly proportional to the number of available solutions. A puzzle with a unique solution could be very hard or very easy, and a puzzle with hundreds of solutions could be hard or easy as well. It all depends on how the pieces interlock with each other. 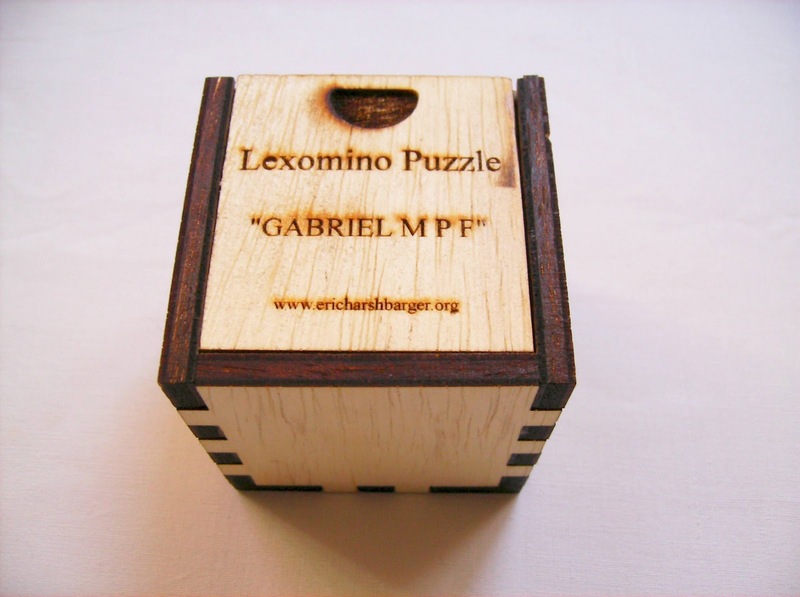 You can buy a Lexomino Puzzle by contacting Eric at the e-mail address found in his page. Each puzzle has a base cost of $25 + $3 per letter + $10 shipping. 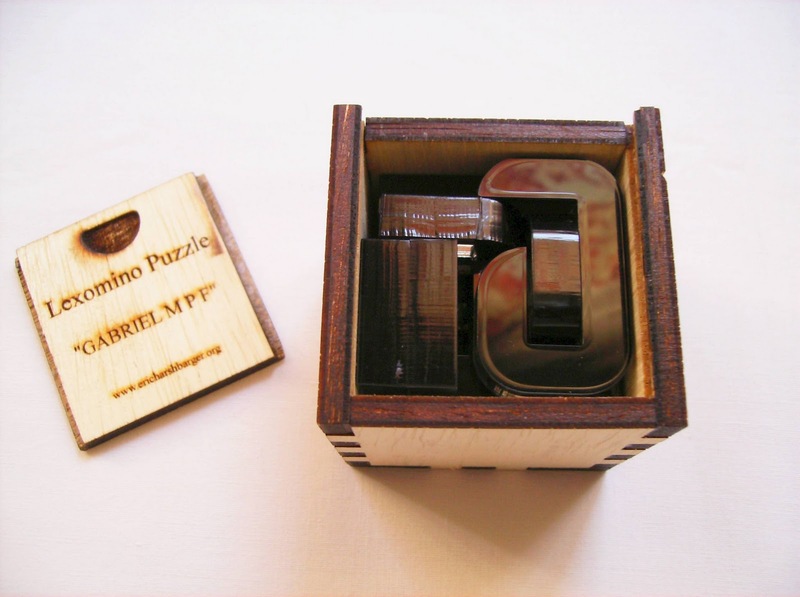 No solution included, although the puzzle comes in its solved state inside the box. If you want a solution engraved on the box, that's another $10). 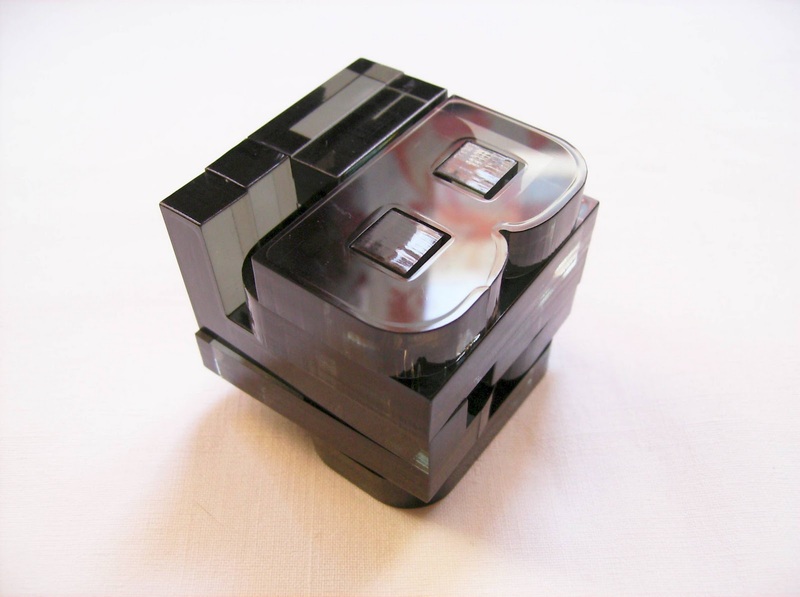 Eric also designs other types of puzzles and makes use of old CD cases in a very original way. Suffice to say, this is now my favorite puzzle. What more could you ask for, than a puzzle made just for you? It makes you feel rather special, to know that you're probably the only person in the world that will play with this particular puzzle configuration. I urge everyone with a passion for puzzles, to get one of these... It's also a perfect present for someone that's into puzzles.